Globalisation is what runs the modern world now especially with the ever-increasing knowledge and advance in technology connecting the world person to person. With modern technology, two people on different sides of the world can talk to each other with instant messaging. In this way the world grows smaller, quicker and easier to live in. It’s not just technology that influenced globalisation, the current ability to have cheap, quick and easy global trade that has given everyone on Earth something not native to their country. As Australia is a fairly new developed country, it is moving away from being a colonised country, globalisation has helped Australia become a wealthier country. Is Globalisation a good thing for Australia? How has Australia been affected and where? This report answers that question. Australian society has expanded to the entire world with modern technology and networking. Australians can now communicate to people around the world in an instant using instant messaging and phone calls as well as the increasing number of international Australian citizens. However, what effect does this have on Australia? 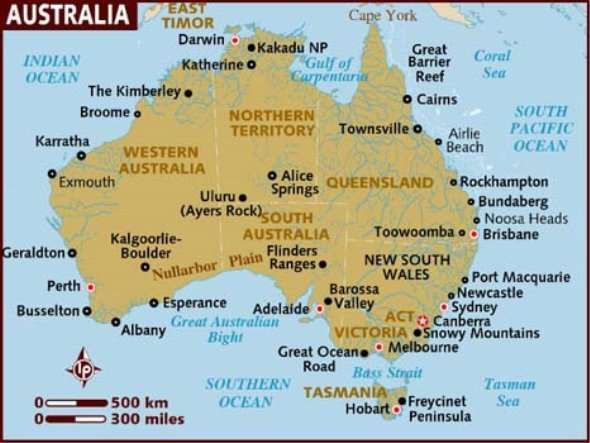 Australia is a fairly new country and often receives information and trade products latest out of most other countries. However, the invention of internet and network has enabled Australians to receive information and retail quicker as well as speak with people worldwide. Australia is close to 3rd world countries and is a fairly cheap source of refuge and international education, this also makes Australia a place for refugees and international families hoping for a good education for their children. Australia is moving closer to the rest of the modern world. With Australia slowly becoming more culturally and ethnically diverse, unwanted attention is being brought to Australia. The recent G20 meeting has started protests across the wealthier and poorer countries to stop G20 as it may separate the world and throw the economy off balance as well as raising awareness for world crisis and demanding for public needs. The public has also divided to challenge the governments to allow or ban refugees from entering Australia. When Australia allows refugees to enter Australia, people protests as the refugees may bring diseases, spies and war. When Australia sends refugees back then Australians protest to allow refugees in the country. Australia has been mainly positively affected by globalisation in society, particularly in the tourist industry. Australia is one of the most unique countries for its strange geographic structure and wildlife. When tourist and refugees that have gained citizenship have seen the country that is Australia, The tourist and refugees will arrange for their friends and family to travel. Australian government has strong connections with other nations with official visits and assisting with international and worldwide affairs. Recent Australian government has made Australia a very involved country with the world, involving Australia in many world affairs such as wars, political meetings and attending to crises. Sometimes the Australian government forgets that there is such a thing as too involved. People have died in assisting international wars, several citizens live in fear of war being brought to Australia through involvement and asylum. G20 has scared off some of the poorer countries and some are taking advantage of the meeting and protesting for the world leaders to serve their needs. Currently Australia has good favours with wealthier countries but connections with the poorer countries is rusty or unknown due to involvement. However, the country has benefitted from the government’s decisions, connections made and favours from Britain. Australia is also slowly getting wealthier, only a decade ago, people mainly drove cheap but practical Japanese cars but now expensive and better looking European cars are driving around the streets. Australia has been isolated from other continents for billions of years and this has allowed Australia to hid it’s valuables until modern technology found them. Australia is rich in iron and coal and as the country itself doesn’t need it, all the raw materials are sold overseas. However, how much is used here and how much is bought from overseas? Australia’s economy is focused on the mining industry and its exports. Australia exports mainly to countries with low iron, coal and gold deposits such as major Asian countries with fast development and requirement for steel. Modern technology has allowed for a year of mining to travel to overseas countries in less than two weeks by boat and about a week by plane factoring in the travel time from mine to port. Being a top exporter for mining products, this makes Australia a favourite for metal exports, most exports going to China, Japan, Korea and the United States. Apart from mining and gas exports Australian farming, medicinal chemicals and animal food products are bought by other countries and combined with all the other top exported products, Australia makes approximately $249 billion from raw materials. As Australia is a developed country, everyone is trying to stay up to date with the rest of the world and imports computers, machines, parts and cars which are all new, always updating and very expensive. Cars also need fuel to run on so large imports of crude and refined petroleum are bought in plenty as well as medicine for Australia’s sick and injured. Overall, adding all the top imports together, Australia spends about $240 billion on imports, only about $9 billion of profit. Australia spends large amounts of money on imports and leaving a little left for saving. Being a young country means Australia doesn’t have a good economic foundation to build on or much variety to offer. To keep up with the world, much has to be imported mostly computers and many different types of machines, all new and expensive. With $249 billion made from exports and $240 billion spent on imports, quite a lot of the products imported are used and not re-sold. Possibly the only time Australia made the most money was during the gold rush and the start of the microchip age. Australia was an originally isolated country where people lived with and not off of the country until European settlement started and the coasts were over taken with modern technology. Was European settlement really beneficial for Australia? Was the old way of living for the indigenous the better way? Which way is better now? In one way, being a young country is good, the Australia is possibly the least polluted and destroyed major European country. Australia is often choosing the most sustainable options for the country as the wildlife and vegetation native is not found anywhere else and currently, introduction of wildlife and vegetation is taking over much of the original land. Australia is mostly dusty red desert with dry deep-rooted plants, it is also where most of the most plentiful raw mining materials are. Australia is a country that can relate to District 12 of Panem, a country of miners. The desert of Australia is slowly becoming more unstable with the replacement of short-rooted plants, the dust storms of 2009 were caused by the combination of uprooted plants, bushfires, salinity and holes in the country for mining. People experience low visibility, possible blindness, dusty clothes, machines and houses. The dust was dumped all over Eastern Australia and the surrounding seas and coasts. Too much has happened to the country that has not helped, the gold rush, introduction of wildlife and vegetation and general European influence from settlement. The way the indigenous Australians lived was a more peaceful and safe than the modern way of life where the more people rip up the land, the better for the people. Soon there would be nothing left for humans to live on and technology won’t be able to feed us. Cite This For Me, (2014). Cite This For Me: Automatic bibliography generator. [online] Available at: https://www.citethisforme.com/ [Accessed 25 Nov. 2014]. Citewrite.qut.edu.au, (2014). QUT cite|write – Writing a report. [online] Available at: http://www.citewrite.qut.edu.au/write/report.jsp [Accessed 25 Nov. 2014]. D’Costa, A. (2014). Will growth mean more jobs? Not necessarily. [online] ABC News. Available at: http://www.abc.net.au/news/2014-11-14/dcosta-g20-should-focus-on-jobs-not-growth/5891308 [Accessed 26 Nov. 2014]. Fisher, M. (2013). A revealing map of the worldâ€™s most and least ethnically diverse countries. [online] Washington Post. Available at: http://www.washingtonpost.com/blogs/worldviews/wp/2013/05/16/a-revealing-map-of-the-worlds-most-and-least-ethnically-diverse-countries/ [Accessed 26 Nov. 2014]. Globalization101, (2014). What Is Globalization?. [online] Available at: http://www.globalization101.org/what-is-globalization/ [Accessed 25 Nov. 2014]. Green, J., Muller, S., Johnson, D., Danko, M., Barret, T. and Meyer, R. (2014). Globalization II – Good or Bad? : Crash Course World History #42. [online] YouTube. Available at: https://www.youtube.com/watch?v=s_iwrt7D5OA [Accessed 26 Nov. 2014]. Green, J., Muller, S., Johnson, D., Danko, M., Meyer, R. and Barret, T. (2014). Globalization I – The Upside: Crash Course World History #41. [online] YouTube. Available at: https://www.youtube.com/watch?v=5SnR-e0S6Ic [Accessed 26 Nov. 2014]. IMPACTS, G. (2014). GLOBALIZATION AND ITS SOCIAL-CULTURAL-POLITICAL AND ECONOMIC IMPACTS. [online] Academia.edu. Available at: http://www.academia.edu/4668865/GLOBALIZATION_AND_ITS_SOCIAL-CULTURAL-POLITICAL_AND_ECONOMIC_IMPACTS [Accessed 25 Nov. 2014]. Investopedia, (2014). How Globalization Affects Developed Countries. [online] Available at: http://www.investopedia.com/articles/economics/10/globalization-developed-countries.asp [Accessed 25 Nov. 2014]. Moodle.sjac.qld.edu.au, (2014). [email protected]: Login to the site. [online] Available at: https://moodle.sjac.qld.edu.au/moodle/course/view.php?id=718 [Accessed 25 Nov. 2014]. Moodle.sjac.qld.edu.au, (2014). [email protected]: Login to the site. [online] Available at: https://moodle.sjac.qld.edu.au/moodle/mod/forum/view.php?id=24840 [Accessed 25 Nov. 2014]. Morin, R. (2013). The most (and least) culturally diverse countries in the world. [online] Pew Research Center. Available at: http://www.pewresearch.org/fact-tank/2013/07/18/the-most-and-least-culturally-diverse-countries-in-the-world/ [Accessed 25 Nov. 2014]. Um.dk, (2014). What is a Trade Barrier. [online] Available at: http://um.dk/en/tradecouncil/barriers/what-is/ [Accessed 26 Nov. 2014]. "Impact of Globalisation on Australia." UKEssays.com. 11 2018. 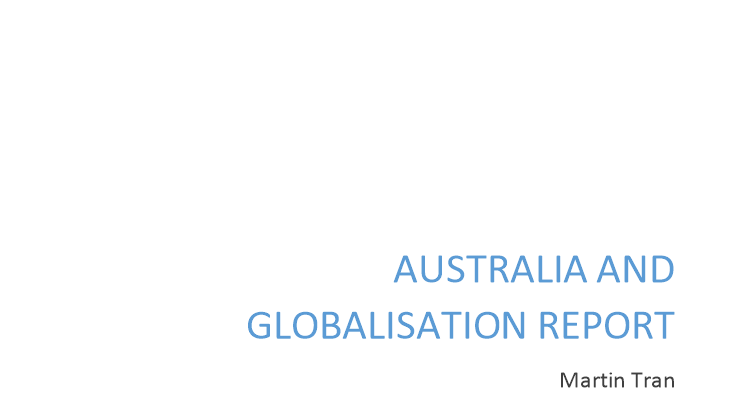 All Answers Ltd. 04 2019 <https://www.ukessays.com/essays/geography/impact-globalisation-australia-9163.php?vref=1>. "Impact of Globalisation on Australia." All Answers Ltd. ukessays.com, November 2018. Web. 23 April 2019. <https://www.ukessays.com/essays/geography/impact-globalisation-australia-9163.php?vref=1>. UKEssays. November 2018. Impact of Globalisation on Australia. [online]. Available from: https://www.ukessays.com/essays/geography/impact-globalisation-australia-9163.php?vref=1 [Accessed 23 April 2019]. UKEssays. Impact of Globalisation on Australia [Internet]. November 2018. [Accessed 23 April 2019]; Available from: https://www.ukessays.com/essays/geography/impact-globalisation-australia-9163.php?vref=1.